However, I've been thinking a lot about nutrition and hydration strategies recently, and was determined that I would be disciplined during this race, to see if that could help my performance. The one thing I really remember about the Scott Jurek talk I went to a couple of months ago, was his advice about regularly fuelling during an ultra - a drip feed throughout the race. I knew the aid stations wouldn't be the usual picnic benches they can be at ultras, so I planned to take all my own food, and regularly take on calories. Anyway, I finally got to the Shoulder of Mutton pub in Wendover and although there were long queues with all of us who'd just arrived from London, it was well managed and we were soon good to go. I had the great surprise of seeing my friends, Steph and Keith (who'd come to support me during the 10in10 too) and Becca and Mark, at the pub, who'd got up stupidly early for a Saturday morning to see the start of the race. Having support makes a world of difference and it was lovely that they were there for me. 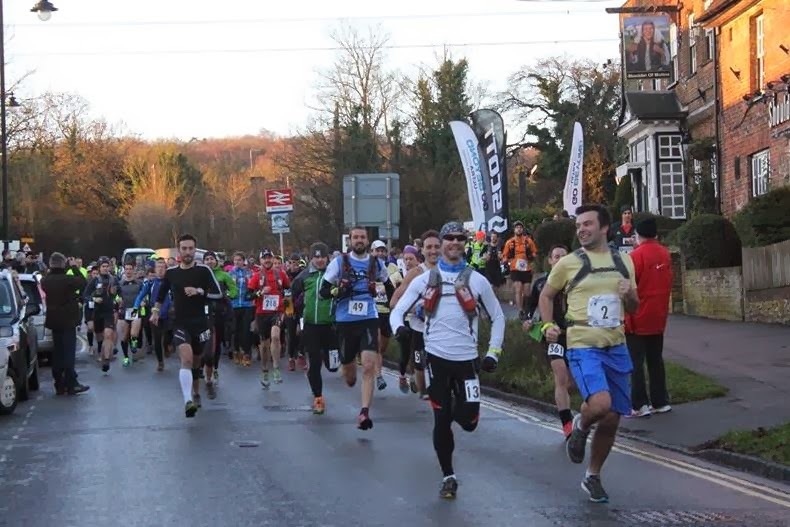 The first 20-odd miles of the race are across stunning countryside. Some very muddy countryside, but beautiful nonetheless and the weather was absolutely perfect - cool but dry and sunny. There were a lot of runners, and so we had long queues at the stiles and kissing gates which knocked everyone's average pace right down, and we all marched up the hills in single file, but I'd been worried about having to map read (no route instructions for this course other than an OS map book) and having so many runners around meant that I was very happy to be able to follow the rest of the crowd. Relieved to say we didn't go wrong once! The mud was shocking in places, particularly in one field where I managed to lose a shoe - it was so sticky and deep it just pulled my Speedcross right off my foot leaving me balanced on one leg with my shoe stuck in the ground over a meter behind me! Thankfully, a very kind fellow runner came to my aid, and rescued my shoe, but not before my sock had also got covered in mud - a generally very messy affair! I saw Steph, Keith, Becca and Mark four times in all around the course, and each time it was a massive boost and lovely to stop and chat with them for a bit. A massive thank-you to them all for spending their Saturday traipsing round the countryside trying to work out where I was going to pop up next! 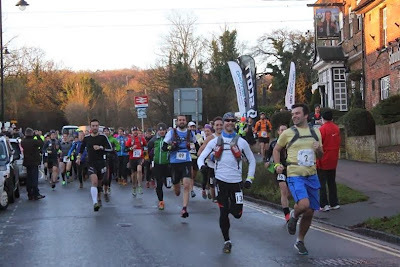 I was carrying a bottle of water and one of Lucozade Sport, a packet of salted peanuts, flapjack, a bounce ball (one of these), and 6 High-5 gels (3 with caffeine, 3 without) in my excellent UltrAspire revolution race vest. My plan was to have a drink of Lucozade or water every 2 miles, alternating between the two, filling up the water at aid stations. On the miles I drank water, I would also take on either a gel or some real food. When I got to the aid stations I'd drink extra if I wanted it, but wouldn't worry about having any of the food provided, which would be minimal anyway. I'd also decided I have going to have painkillers after 2 hours, and then again at 6 hours. Unusually, I stuck to my plan. I ate regularly, drank regularly, and didn't feel hungry at all...or overloaded from binging on the aid station food which often happens! Anyway, through the first 20 miles I walked all of the uphills and ran pretty much all of the rest and was with a group of other runners which helped keep me going. I had pain in my hamstring from the beginning but it was a niggle rather than anything too problematic and somehow I managed to ignore it the whole way through and so didn't make the mistake of stopping to stretch which is always such a waste of time! For the last section, on the towpath, I was on my own. I plugged in the ipod, and settled in to finish it off. I couldn't believe how good I was still feeling, but was very pleased. I decided that as there weren't any hills to be walking up, I would try out something different that I'd read about. Rather than waiting until I felt I needed to, I'd walk the first 30 seconds of every mile. Sometimes it was a little longer (if I was having some food, or at one stage when I was trying to use the phone) but generally I was disciplined - I stopped running at the beep of my watch, walked as I counted to 30 and then headed off again. I felt brilliant. I was in control of my race, my legs were working, I was maintaining a much better pace than I'd ever dreamt of achieving at this stage, and I was loving how it felt. My back didn't hurt - I think because I would concentrate on my posture during every walking section - and I knew I was performing so much better than I've done in any other ultra. 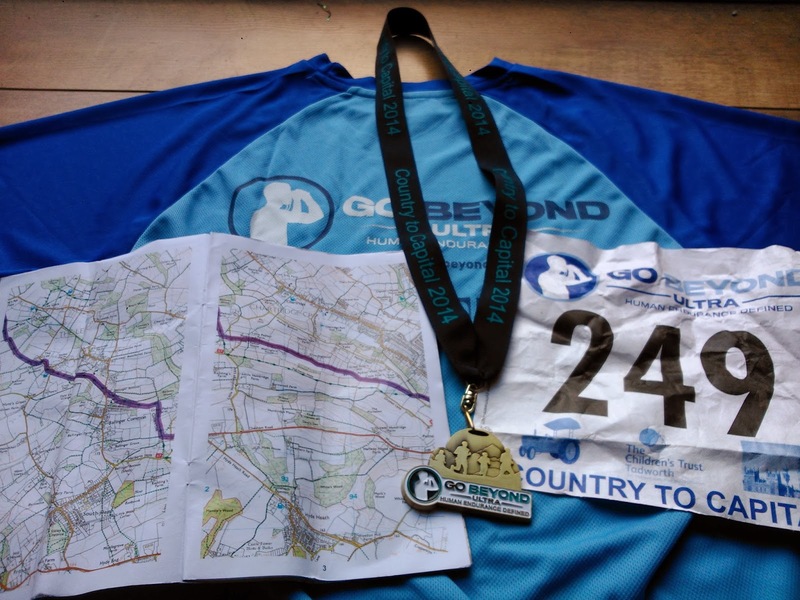 I had expected to finish in about 10 hours, as my time for the St Peter's Way event, the only other 45 miler I've done, was 10:08. Both Country to Capital and St Peter's Way are, in fact, a little short of 45 miles, (I think you only get to 45 miles in either of them if you get lost) and C2C ended up being 43 miles on my Garmin, and although the towpath section of the C2C does make it easier than the SPW, it is hillier so I think they're comparable races. I suddenly realised that I was looking at a sub 8:30 finish time! I pressed on, started overtaking people, and still felt really strong. I soon realised that we were near the end. It was starting to get darker, but I didn't need my head torch yet, and was really keen on finishing without using it, which I was sure I could do, as I was still feeling as good as I had done for the last 15 miles. There were a few bridges on the tow path that I walked up, but kept going, and then there were more people lining the route and I realised the finish line must be close. All of a sudden, I ran under a bridge, and the finish line was there!! Lights, flags, the photographer....and my medal. Done!! 8 hours 10 minutes. To give you an idea of what other people can achieve, the winner of Country to Capital this year was Ed Catmur, who finished in 4:48, which is an absolutely mind blowing time. I can't begin to imagine how he did it but it's fantastic. Even though I was nearly 3.5 hours slower than the winner, and in 166th place (out of 315 who started), and 18th in my age group, I still felt great. In fact, absolutely over the moon. I could have quite happily carried on running further down that towpath, which is such a boost as my training for the TP100 really kicks in. I'm putting it down to the regular eating, drinking and walking - doing it all in such a disciplined way gave me control - and the bonus of having support out on the course from my friends. I'll never be an Ed Catmur but it doesn't matter in the slightest - being an incredible 2 hours faster than I expected has left me on a total high and I absolutely loved it. Thanks so much Tim :D You should definitely give an ultra a go! Well done Naomi, I am so pleased for you that this has gone so well. I know if you apply the same tactics you will achieve your goal of doing the 100miler in May. - good luck! great blog. Congrats! What a great start to the new year.